Public Workshop leads an interactive session at The Oval in 2016, modeling Fairmount Park out of chocolate cake to better understand park-goers’ perceptions and needs. Artist Claes Gabriel talks with festival visitors about his intricately-painted Totems, marking the entrance to West Park Arts Fest. Two finishers of the annual Boxers’ Trail 5k spar on the basketball courts at Mander Recreation Center. The Conservancy is working with Strawberry Mansion residents to honor the memory of Smokin’ Joe Frazier, whose training in Fairmount Park inspired the name of the Boxers’ Trail. At each stop on the Celebrating Coltrane 2017 Jazz Walk, saxophonists join the procession to the John Coltrane House in Strawberry Mansion. Celebrating Coltrane 2017 culminates in a performance by the venerable Odean Pope Quartet on the porch of the Hatfield House. Fairmount Park Conservancy is the nonprofit leader that works to make Philadelphia’s park system the best in the United States. We work across 10,200 acres that include Fairmount Park and 115 neighborhood parks around the city. We believe that parks have the potential to serve as our great connector and equalizer, as catalysts for positive change throughout the city. Our primary focus within the Community Development Investments program is on two neighborhoods adjacent to Fairmount Park: East Parkside and Strawberry Mansion. We hope in working with artists to reach new audiences and to develop new tools to steward, interpret, and navigate the cultural landscape of Fairmount Park -- not just the park itself, but the way it reflects, engages, and serves adjacent communities. 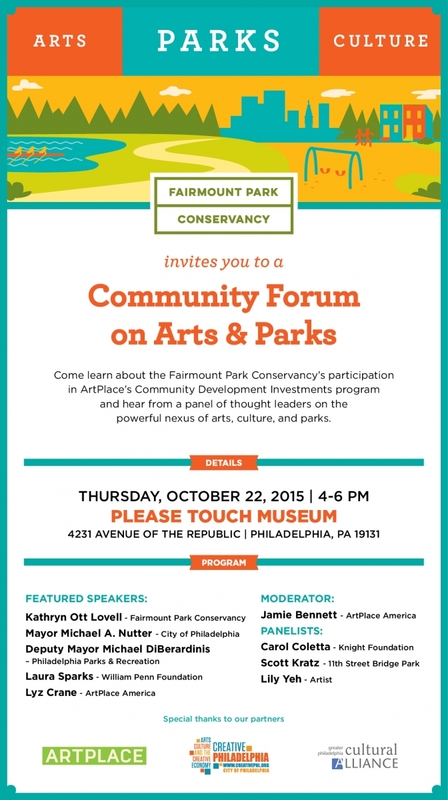 Fairmount Park Conservancy is the nonprofit leader that works to make Philadelphia’s parks the best they can be. We work across 10,200 acres that include Fairmount Park and 115 neighborhood parks around the city. We believe that parks have the potential to serve as our great connector and equalizer, as catalysts for positive change throughout the city. Incorporated in 1998, the organization spent our first 10 years raising more than $20 million for improvements to the Philadelphia park system while increasing public awareness of the park’s role in the health and vibrancy of the region. Over the last five years, our mission and work has evolved beyond fundraising to position us as a collaborative leader and partner, focusing more strategically on planning, project management, program development, and community engagement. Today, we work closely with Philadelphia Parks & Recreation to develop and implement projects and programs that support, improve, and enhance Philadelphia’s parks. We have grown to a staff of 28, managing a diverse portfolio. We engage communities through park stewardship and civic initiatives. We lead capital projects, restore natural lands, and preserve historic structures. We organize programs spanning fitness, education, and culture to connect more people to parks, ensuring that all Philadelphians have access to the social, health, economic, and cultural benefits that we believe are intrinsic to parks. FPC hosted a community forum to kick-off the CDI program in October 2015. Click here to view the program from the event and you can watch the video below. Fairmount Park Conservancy serves as the steward of 10,200 acres of parks throughout Philadelphia, including Fairmount Park, one of the largest urban parks in the country, and 115 neighborhood parks. The communities and neighborhoods adjacent to these parks vary in size, demographics, and access to resources – a range reflected in the parks themselves. Our primary focus within the Community Development Investments program is on two neighborhoods adjacent to Fairmount Park: East Parkside and Strawberry Mansion, where major capital projects are happening under the umbrella of the Civic Commons initiative, a multi-year pilot effort led by the Conservancy that is using investment in five capital projects to draw Philadelphia’s leading nonprofit public space operators into a collaborative network. Both East Parkside and Strawberry Mansion were first developed in the late 19th century and populated by middle-class and wealthy immigrants. In the early 20th century, the neighborhoods were home to Jewish immigrants and today they have become primarily African-American communities. Having experienced decades of disinvestment, both communities are now committed to a better, self-determined future. They have historic housing stock, strong cultural identities, and challenges related to vacant property and real estate speculation. Both lie adjacent to large expanses of parkland, separated by heavily-trafficked streets. Former trolley lines that once made travel through the park accessible have long been closed. In recent years, while many of Center City’s parks and plazas have benefited from renewed investment and attention, many neighborhood parks have remained untouched and in decline. Philadelphia is poised to address this disparity with the Rebuild Initiative, a $500 million investment in parks, recreation centers and libraries made possible by the passage of a sweetened beverage tax in 2016. With these ongoing and future investments, Philadelphia is making the case for parks as platforms for equity – free, sacred spaces that encourage people from all walks of life to come together to build community. This belief grounds the Conservancy’s work throughout the city. Our initial efforts in adapting arts and cultural strategies are strengthening and expanding our work in the neighborhoods adjacent to Fairmount Park. By forging new partnerships with artists and cultural producers, we are better equipped to tap into critical community voices to ensure that our future planning and decision-making processes for new park investments are truly collaborative. Artists bring a unique set of skills and perspectives to the community development table and are adept at giving voice to community narratives and proposing strategies that are outside the bounds of traditional park planning, development, stewardship and programming. We hope, by continuing our work with artists, to reach new audiences and to develop new tools to steward, interpret, and navigate the cultural landscape of Fairmount Park -- not just the park itself, but the way it reflects, engages, and serves adjacent communities. Two years ago, our contributions to the cultural landscape were minimal – beyond a select few partnerships and program offerings, arts and culture did not have a significant place in our organization nor a deep connection to our work in parks. Today, with the support of the Community Development Investments program, we have infused arts and cultural strategies into our work and our partnerships as well as our organization’s daily operations and strategic planning efforts. In 2016, our first year formally working with arts and culture at the Conservancy, our activities included a host of workshops, engagement efforts, exhibitions and related programming, touching on the many aspects of our organization and the park system. Fairmount Launch at The Oval presented several late-summer events designed to better connect the visitors of the pop-up space with Fairmount Park, taking a signature project and imbuing it with a new purpose. Guided bike tours highlighted future park plans and public art; a collaboration with local design collective Public Workshop invited participants to create a model of the park in chocolate cake; a flag-making workshop hosted by Camp Little Hope led to user-made flags depicting Fairmount Park. All of these events were connected to the distribution of the “50 Unique Experiences” map of Fairmount Park, the first of its kind created by the Conservancy. We commissioned 12 artists to create birdhouses to raise awareness of the importance of meadows as an urban ecosystem, relating to our work in natural lands restoration. Meadows, critical for groundwater recharging and habitat creation, attract several species that nest in Fairmount Park. Built for these species, the birdhouses are now installed throughout the park. A newly issued map and a new series of guided bike rides are allowing us to share these creations with our members and the public. At six active historic houses that ring the Schuylkill River in East and West Fairmount Park, we hosted public lectures, open houses, and art exhibitions, drawing hundreds of people into their first experience with these properties and inviting them to think about the park and its legacy in new ways. We are working in partnership with Philadelphia Parks & Recreation and other entities to imagine how these historic homes can adapt to changing urban environments, playing a larger role in understanding our city’s history and acting as community anchors to their adjoining neighborhoods. In this first year, we also laid the groundwork for a one-year neighborhood-based artist residency at the Hatfield House in the Strawberry Mansion neighborhood, embarking on a significant partnership with Amber Art & Design, a local artist collective with a varied body of work ranging from traditional public art and murals to social practice and performance. Within our organization, we brought on two staff members to manage our arts and culture work, and undertook a branding and communications plan for this work. This culminated in the launch of our Arts & Culture Program website in March 2017, providing a larger public platform for our ongoing arts and culture work. Years two and three of the Arts & Culture Program have focused on expanding programs and deepening partnerships in specific communities neighboring Fairmount Park. Amber Art & Design have begun their residency at the historic Hatfield House, which is located at the juncture of the park and the neighborhood. Amber is working with the Strawberry Mansion community to map cultural assets, amplifying our shared understanding of the neighborhood’s needs and priorities. Amber will also develop a conceptual neighborhood park gateway for Mander Recreation Center. The residency kicked off with an Open House in October 2017. This event showcased the exhibition of two Strawberry Mansion-based artists, painter Trisha Sealy and photographer Snapshot. For many attendees, it was the first time they experienced being inside the Hatfield House. Meanwhile, MING Media, videographers based in Strawberry Mansion, are documenting neighborhood stories and portraits -- capturing the Conservancy’s work in the area and featuring the people and stories that define the neighborhood, particularly as it faces growing development pressure. These narratives are illuminating the neighborhood’s relationship to Fairmount Park. The Conservancy began a partnership with the Philadelphia Jazz Project to bring live programming near the vacant former home of iconic musician John Coltrane. A former resident of Strawberry Mansion, Coltrane’s legacy lives on in the neighborhood, and the Conservancy co-hosted several community events in summer and fall 2017 that celebrated Coltrane’s connection to the neighborhood. The Conservancy is exploring partnership options to enable the John Coltrane House to become an active and open cultural facility in partnership with the owners and Strawberry Mansion community leaders. We partnered with West Park Cultural Center to host the 10th annual West Park Arts Fest, held outdoors in Fairmount Park for the first time. The change in location, festival atmosphere, history-rich programming and contribution of temporary works by five Philadelphia artists presented new opportunities to encourage residents to overcome a sense of disconnection from the natural space and an accompanying perception that Fairmount Park is not for them. Planning for next year’s festival is now underway to further build connections between the annual event and the completed first phase of Centennial Commons, one of our major capital projects. We have worked to expand the scope and reach of our seasonal pop-up park on the Benjamin Franklin Parkway, which draws more than 100,000 visitors each year. In addition to working with a cache of more than 40 partners to program the site five days per week over six summer weeks, this year we engaged designers at PORT Urbanism to expand the footprint of The Oval east to include pop-up sites on the apron of the Free Library of Philadelphia and the Franklin Institute and to help us begin conversations with the public about future uses of The Oval and the entire Parkway. With PORT, we created structures with iconic Philadelphia-themed imagery and lighting to draw visitors from all areas of Center City and solicit their input on the best uses and potential of the entire length of the car-dominated Parkway. This input is factoring into plans led by Parks & Recreation and the Conservancy to create a more pedestrian-focused environment in 2018 and beyond. Finally, we have made meaningful advances in integrating artists into our internal operations. We recently engaged an artist on the creation of a communications hub, to assist staff communication and enable a richer level of collaboration. With a new Strategic Plan on the horizon, we have asked prospective firms to include an artist on their team so that we can continue to put arts and culture strategies at the center of our mission to connect people to parks.